Nursing is for compassionate people who want to make a difference in the world. You are invited to be a part of shaping the future of health in Saskatchewan and beyond. You will learn all aspects of health and well-being across a person’s life span as you study nursing, health and the health-care system through the creation and integration of knowledge from research, education and practice. 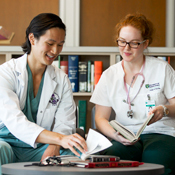 At the University of Saskatchewan (uSask), your path to becoming a registered nurse is supported every step of the way through innovative teaching methods, a strong community of support and many opportunities for personal and professional development. Nursing requires clinical experience. Our program includes access to clinical practice opportunities in hospitals and community agencies with exceptional nurses committed to quality patient care. Clinical practice gives you experience, empowering you to make a difference in the future of health care. You will have many opportunities to interact with students and faculty from a wide variety of disciplines, such as clinical psychology, dentistry, kinesiology, medicine, nutrition, pharmacy, physical therapy, sociology and veterinary medicine. Build relationships with individuals who will be working in other health science professions when you become a Registered Nurse. To help Aboriginal nursing students become successful nurses, the University of Saskatchewan Community of Aboriginal Nursing (UCAN) will help you learn about careers in the field of health, find support and advising while you complete your B.S.N., participate in a mentorship program when you are ready to transition to the workforce and access continuing education as you further your career. The College of Nursing is committed to a “learn where you live” philosophy. Take your program at campuses in Prince Albert, Regina and Saskatoon or through distributed learning (video and web conferencing, blackboard online, lecture capture and remote presence “robotics”) at sites in Île-à-la-Crosse, La Ronge and Yorkton. Nursing is the largest health care profession in the world. Nurses work with their minds, hands and hearts, while using advanced technology to provide health-care services to individuals, families, groups and communities. Learn more about hourly wages for RNs in Saskatchewan. Hospitals – medical, surgical, pediatrics, obstetrics, etc. Community – public health, schools, addictions, shelter agencies, etc. Long-term care – secure environments, care homes, rehabilitation residences, etc. Canadian Indigenous Nurses Association, Emergency Nurses Association, International Association of Forensic Nurses, etc. Tuition will vary depending on the type and number of classes you take in a year. This estimate reflects a typical amount you could expect to pay in your Year 2 if you enroll in a full course load, the maximum number of courses allowed (2018-2019 Canadian dollar rates). Do you already have university experience? The Post-Degree Bachelor of Science in Nursing (B.S.N.) is an option which recognizes previous university achievements and provides the opportunity for students to earn a B.S.N. in a condensed period of time. It is a two year program leading to a full Bachelor of Science in Nursing degree. It is available to students who have completed a baccalaureate degree in another field or who have made significant progress toward a degree. This option provides the opportunity for full-time intensive study with program completion in less than two calendar years. There are different admission requirements and application procedures for the post-degree option. The Bachelor of Science in Nursing (B.S.N.) is a four-year program that includes a pre-professional year (Year 1) of prerequisite university-level courses, followed by three years (Year 2, 3 and 4) of concentrated nursing education and clinical practice opportunities. You may complete your pre-professional year at uSask, University of Regina or various regional colleges in Saskatchewan. If you’re interested in attending here, you should apply to the University of Saskatchewan's College of Arts and Science to complete the 30 credit units of pre-professional courses required for Year 1 of the degree program (listed below). All students interested in pursuing nursing for years 2, 3 and 4 at one of our sites, must apply for admission to the College of Nursing during the first year of study. These pre-professional courses need to be completed by April 30th if you wish to start Year 2 of nursing in September. ** a deficiency is allowed in one of these four areas. A grade of 50% will used in place of the deficient course in the average calculation. Applicants must successfully complete the deficient prerequisite by December 31 of the year in which they are admitted to Year 2 of the BSN program and provide proof of completion of the course by January 15.
electives provide you with the choice to customize your program and you are encouraged to take courses that interest you. Admission average will be dependent on the admitting institution where the pre-professional courses are being taken. The pre-professional year courses can be obtained through a variety of sources and locations in the province. Students may also complete their pre-professional year course requirements at First Nations University, other regional colleges throughout Saskatchewan and in another province or country, as long as the courses transfer to the University of Saskatchewan to meet course requirements. Contact these institutions directly if you are interested in applying. In years two through four, students develop critical thinking skills to prepare them to meet the diverse competencies required when becoming a Registered Nurse (RN). See below for B.S.N. admission requirements and application procedures. Students may complete Years 2,3 and 4 at campuses in Prince Albert, Regina and Saskatoon or through distributed learning (video and web conferencing, blackboard online, lecture capture and remote presence “robotics”) at sites in Yorkton, Ile-a-la-Crosse and La Ronge. The Course and Program Catalogue has the complete and official listing of required classes and their descriptions for the Four-year B.S.N. in Nursing. Part-time study in the B.S.N. program is an option; however, all courses must be completed within six years of entering the College of Nursing. A high level understanding and functionality in English is essential for safe client care in health professions in Saskatchewan. Applicants whose primary language is not English must present evidence of proficiency in English, regardless of country's official language. Primary language shall be defined as the language you learned at home in childhood or the language which you identify as knowing best and being most comfortable with and is the language primarily used for reading, writing, listening and speaking. Prior attendance at a Canadian high school or having 18 transferrable credit units from an English speaking/testing institution are not adequate evidence of English language proficiency. The following examination scores serve as evidence of English language proficiency. Prospective students should note the minimum requirements that must be attained for admission to nursing programs at uSask. *Note: Paper based test is not accepted. Applicants are admitted on the basis of post-secondary course work. Applications are accepted from residents of all Canadian provinces and territories and international countries. Canadian or international residency status is not considered in the application process. Applicants select the site in which they prefer to study at the time of application. 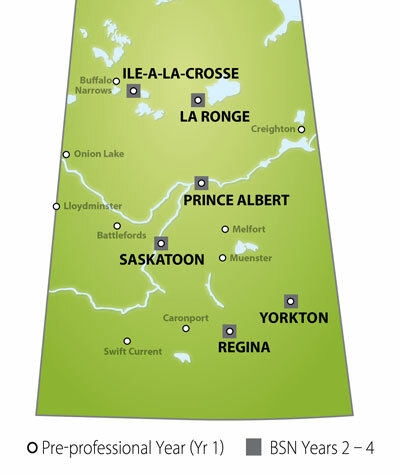 Students who select to study in Northern Saskatchewan must be residents of that area, according to provincial geographical definition. There is a separate category in which 16.6% of the total number of second year seats are reserved for persons of Aboriginal ancestry. Applicants must provide proof of Aboriginal Ancestry. Like regular applicants, transfer applicants are admitted on the basis of post-secondary work and must meet the minimum competitive admission average. Any transfer credit given for prior Nursing courses will be determined by the College of Nursing. Years 2, 3 and 4 of the B.S.N. program can be completed in Saskatoon, Regina, Prince Albert, Yorkton or at sites in Northern Saskatchewan (Ile-a-la-Crosse and La Ronge). admission is competitive; applicants are ranked according to average and the top candidates are selected. average is calculated using marks from the 30 credit unit pre-professional year. If you are interested in taking year 1 at uSask, you should apply to the University of Saskatchewan’s College of Arts and Science to complete the 30 credit units of pre-professional courses required for Year 1 (see above) of the degree program. View admission requirements and deadlines for the College of Arts and Science. You may complete your pre-professional year at the University of Saskatchewan, University of Regina or various regional colleges in Saskatchewan. View the many locations listed above where you can complete Year 1. All students interested in pursuing nursing for years 2, 3 and 4 at one of our sites, must apply for admission to the College of Nursing during the first year of study. The application for admission to nursing is available starting early October. Transcripts from all post-secondary institutions (regardless of whether or not they pertain to nursing), must be mailed directly from the institution to Recruitment, Admissions and Transfer Credit. Please note the applicant cannot submit the transcript(s). Send official transcripts for all course work completed from each post-secondary institution (other than uSask) you have attended. Submit an unofficial transcript or proof of registration for courses being taken between September and April of the year of your desired entrance date. A final transcript must be sent when all courses are complete. If you are required to provide proof of English proficiency it is your responsibility to have completed a relevant test with the appropriate score before the application deadline. View specific requirements above. Applicants with disabilities must consult with the College of Nursing prior to application. To qualify, applicants must self-identify on the application for admission and submit documentation to verify their status. Learn more about requisite skills and abilities necessary to pursue nursing as outlined by the Saskatchewan Registered Nurses’ Association. Applicants who attended a nursing program in Canada or who have completed a minimum of six credit units or equivalent of nursing classes in Canada are required to submit the completed Program Reference Form. Learn more about additional program requirements including Health and Safety, uniforms and supplies. The four-year Bachelor of Science in Nursing (B.S.N.) and two-year Post-Degree Bachelor of Science in Nursing (B.S.N.) option is offered by the University of Saskatchewan's College of Nursing. Established in 1938, the College of Nursing offers both undergraduate and graduate programming. 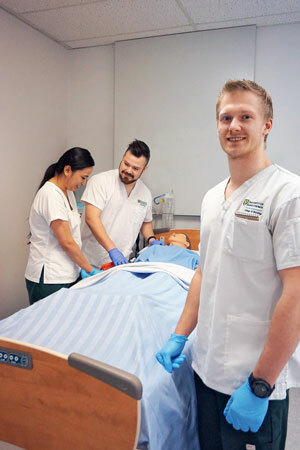 The College of Nursing has campuses in Saskatoon, Regina and Prince Albert and uses distributed learning (video and web conferencing, blackboard online, lecture capture and remote presence robotics) to deliver its B.S.N. program to students in La Ronge, Ile-a-la-Crosse and Yorkton. All College of Nursing graduate programs are available distributively, meaning students can complete them from anywhere. The College of Nursing has a long history of Indigenous student success and is recognized as having the highest number of Indigenous nursing students in the country.